A recent U.S. military vet returns home and is recruited by an agent of Hell to travel through time, capturing rogue demons that are escaping the Underworld and upsetting the balance of good & evil. With Sons of Anarchy, Kurt Sutter established himself as one of the modern masters of storytelling in the 21st Century. 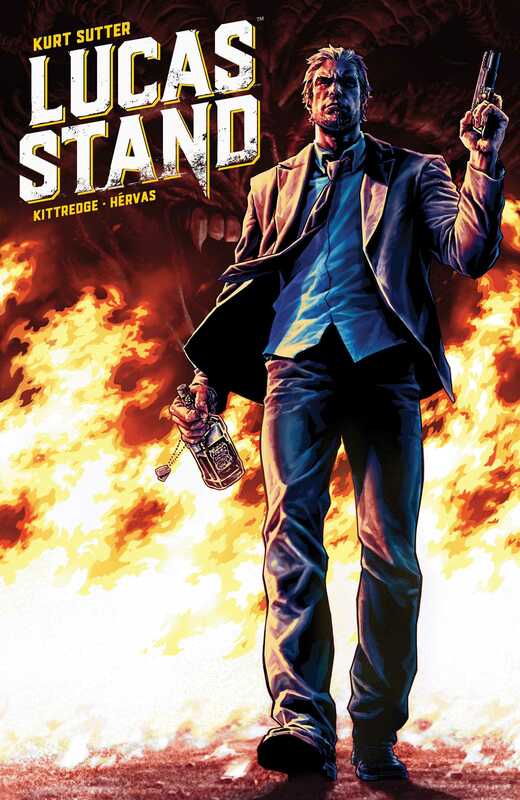 After successfully bringing the massive hit TV show to comics, Sutter now brings fans his first original comic book series, Lucas Stand, featuring an anti-hero for the ages. Lucas Stand is a recent combat vet struggling to reintegrate into society. After doing something terrible and cutting himself off from loved ones, Hell comes calling. He’s offered a chance to make things right – but there’s a catch. Lucas is a soldier once again – this time, fighting for Hell to capture rogue demons who are disturbing the balance of evil. It doesn’t matter where these demons run, Lucas must chase them through time, taking him to World War II, the early days of Hollywood, the Vietnam War, and his own future. Bestselling writer Caitlin Kittredge (Coffin Hill, Nocturne City), and illustrator Jesus Hervas (Clive Barker's Hellraiser) join Sutter in bringing this story of redemption to life.